Bonnybank Bed and Breakfast | A fabulous place to stay on the bank of Twenty Mile Creek. 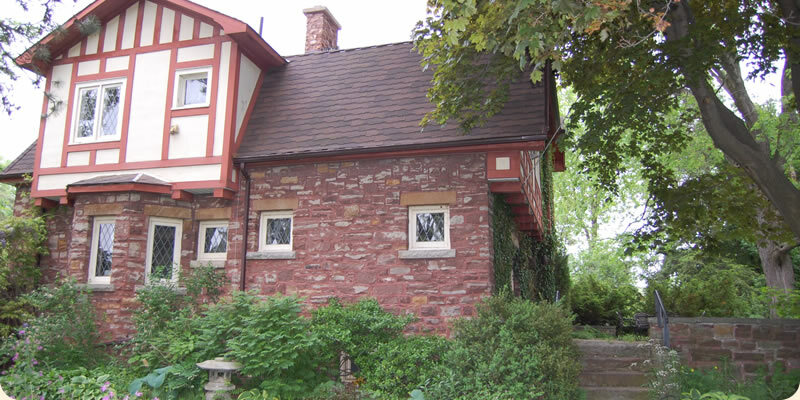 Bonnybank Bed and Breakfast is a 1919 American Tudor Revival home made of red Grimsby sandstone, reclaimed from the nearby Great Western Railway piers. We’re 2 minutes through the Twenty Valley from Jordan Village and 20 minutes from Niagara Falls. Enjoy our tangled Carolinian habitat, next door to a private owl sanctuary with 100 owls. We are on the Twenty Mile Creek ANSI (Area of Natural Scientific Interest) and you can rent canoes and kayaks from the Niagara Rowing School & Paddlesports Centre on our road and photograph song birds, Bald Eagles, marsh inhabitants and rare Carolinian plants. Or, you can birdwatch and poke around our yard to discover Carolinian plant and animal species. Hike or bike along our private line beside peach & pear orchards to the Lake Ontario Waterfront Trail, leading to the Niagara Escarpment, Bruce Trail and Conservation Areas. Need to relax? Wander and putter in our organic vegetable, perennial, shrub and herb gardens. Relax on the stone terrace while the moon sails by, or starwatch by a campfire. Watch for the 2 wild Great Horned Owls that fly in at dusk to sing to the owls in the sanctuary! Your host is Carla Carlson, Horticulturist and past president of a local field naturalist club. She is also the owner of Niagara Nature Tours, rated as one of the top ecotour companies in Canada by the Canadian Tourism Commission. She can tailor make a custom nature, garden, winery, or agricultural tour just for you and guide you privately or give you maps, books and guides to help you explore on your own. Bonnybank Bed and Breakfast awaits you!